IF you wish to receive news about Tuning and products directly into your mailbox, type in your email address and press Enter and you will be registered for receiving such information. 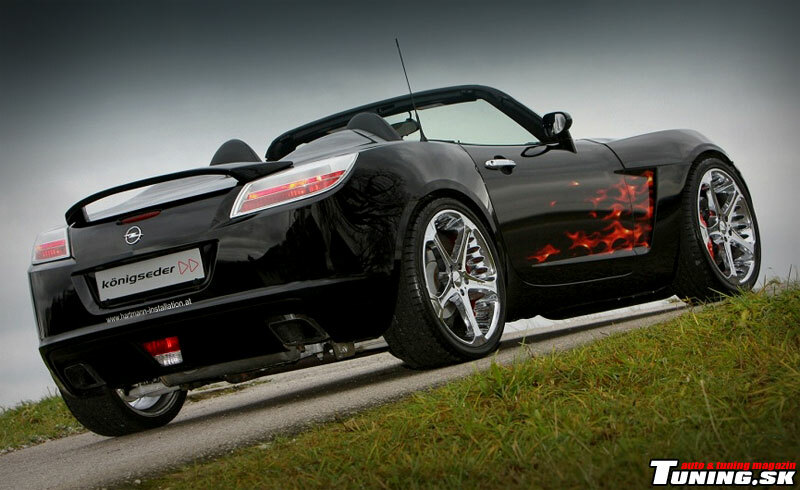 Königseder Opel GT´aime Tuning – the never-ending fun! Sporting roadsters have been always a lure for the most males. There’s something hidden in their case that we can’t find for example in luxurious sporting saloons. The roadsters are really symbols of unchained driving pleasure and great feeling under open skies. Also the first Mercedes convertibles were important and essential in lives of many jocks or Casanovas. Same situation can be seen today, these cars are owned by managers, beach machos, and rebels...simply the people living for this moment. Their philosophy allows to fully enjoying the ride and that’s also available by Opel and its recent model Opel GT – a pure roadster. No doubt that’s extremely popular. So maybe that’s why the GT has become a target of one tuning magician from Austria - Königseder. The year 2007 was full of many events also in the automotive industry. 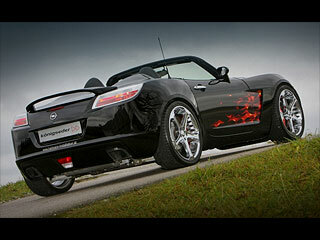 Especially during the famous show in Geneva; where the Opel GT became the convertible of the year 2007. The car merges old school and up-to-date features. 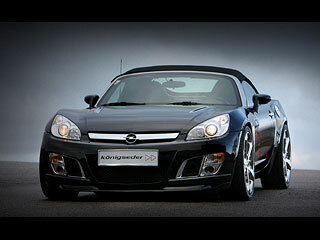 Generally, the Opel GT is a stylish convertible with a traditional canvas roof and legacy of its 40-years old sibling. 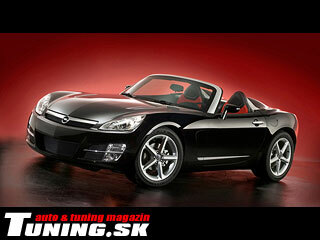 It has untraditional and expressive look, charisma of two-seater and powerful engine. This car changes every ordinary day to something special and chili. Package sells, but what’s under the hood? The Opel GT has a really nice aggregate – nothing less than the 2.0 turbo ECOTEC with direct injection and two balancing crankshafts. It offers totally 264 hp (194 kW) and 353 Nm of torque. The power is transferred to the rear axle by the 5-speed stick shift. The turbo assists from 1400 rpm and that’s enough to reach 100 km/h in just 5.7 seconds and top speed of 229 km/h. This roadster looks great also in its stock version. But the tuner Königseder wasn’t satisfied, so it has created the extreme sporting roadster that can’t be afraid of anything. It offers a visual pack and engine modification. The original design is so good that even little mistake can be disastrous. But Königseder isn’t a newbie and took care about anything essential to avoid collateral damages. The car’s front part owns a newly developed spoiler under the intact front bumper. It’s so precious that looks perfect. It matches perfectly to bold look of the front part while it doesn’t interfere with harmony of the Opel GT. Next and the last elements are at the back with clear tail lamps and distinctive, but decent wing. It’s prefect as its front friend. Another surprise is also under the hood where we can find the modified 2.0 liter engine. New ECU and exhaust system increase its power for 35 hp to the maximum of 300 hp. And that’s quite nice value for the 1300 kg car. These important improvements require also better suspension parts. KW Suspension has provided the Opel GT’s new suspension parts that not only decrease its clearance height, but improves its stability. There are also better Brembo brakes (332 mm brake discs) and amazing red 4-piston brake calipers. Königseder has installed new wheels with luxurious accent and right sporting spark. The car now stands on the 20“ rims named Las Pegas Giovanna Dalar. The interior offers a few changes as for example luxurious red-black rugs including GT’aime logo. 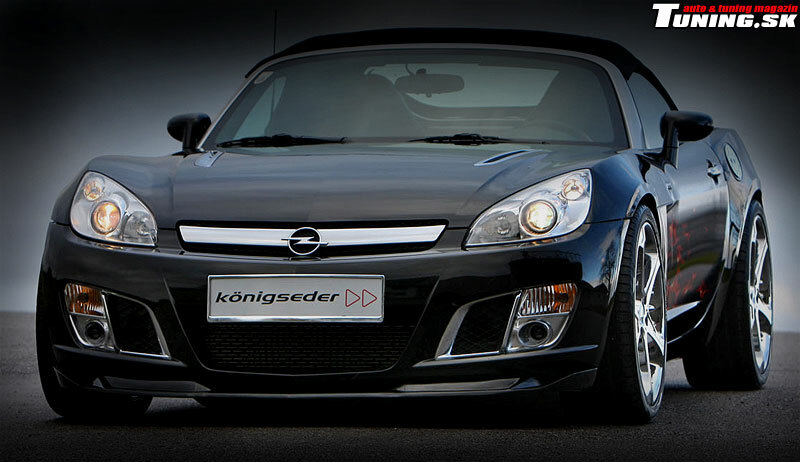 What is your opinion about the Opel GT Tuning by Königseder?